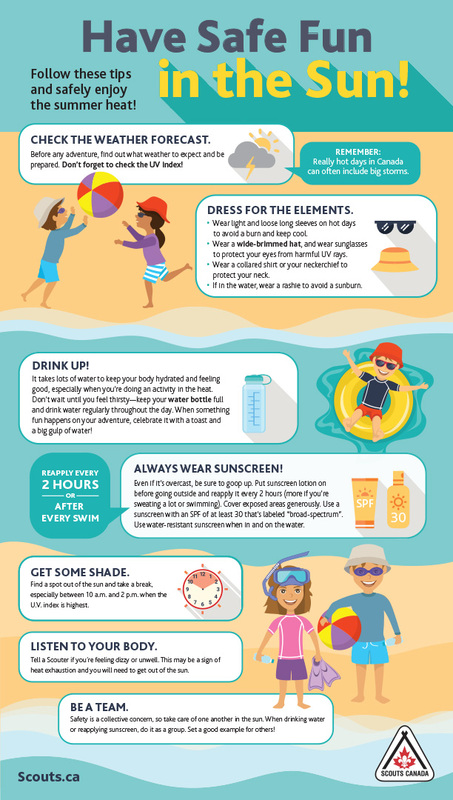 Follow these tips and safely enjoy the summer heat! Before any adventure, find out what weather to expect and be prepared. Don’t forget to check the UV index! Remember Really hot days in Canada can often include big storms. Wear light and loose long sleeves on hot days to avoid a burn and keep cool. Wear a wide-brimmed hat, and wear sunglasses to protect your eyes from harmful UV rays. Wear a collared shirt or your neckerchief to protect your neck. It takes lots of water to keep your body hydrated and feeling good, especially when you’re doing an activity in the heat. Don’t wait until you feel thirsty—keep your water bottle full and drink water regularly throughout the day. When something fun happens on your adventure, celebrate it with a toast and a big gulp of water! Even if it’s overcast, be sure to goop up. Put sunscreen lotion on before going outside and reapply it every 2 hours (more if you’re sweating a lot or swimming). Cover exposed areas generously. Use a sunscreen with an SPF of at least 30 that’s labeled “broad-spectrum”. Use water-resistant sunscreen when in and on the water. Find a spot out of the sun and take a break, especially between 10 a.m. and 2 p.m. when the U.V. index is highest. Tell a Scouter if you’re feeling dizzy or unwell. This may be a sign of heat exhaustion and you will need to get out of the sun. Safety is a collective concern, so take care of one another in the sun. When drinking water or reapplying sunscreen, do it as a group. Set a good example for others!